BAD!SLAM!NO!BISCUIT! gives you a stage microphones an audience MCs judges scores The Master of Conflict and adding for your two minutes of your original material on the Phoenix stage for prizes! So many prizes, all first prizes! 'Scotland's finest angry young man turned incredible storytelling acoustic punk poet. Filling The Hadley Memorial Slots will be Charlie Quinn! And so you are not confused and think that is it for feature acts! So join BAD!SLAM!NO!BISCUIT! 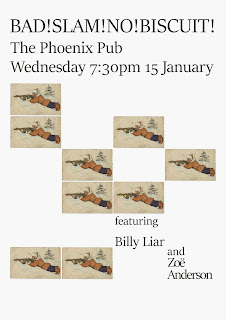 at the Phoenix Pub, sign-up at 7:30pm, and remember we want your original material, no music, no props, all on stage for two entire minutes.